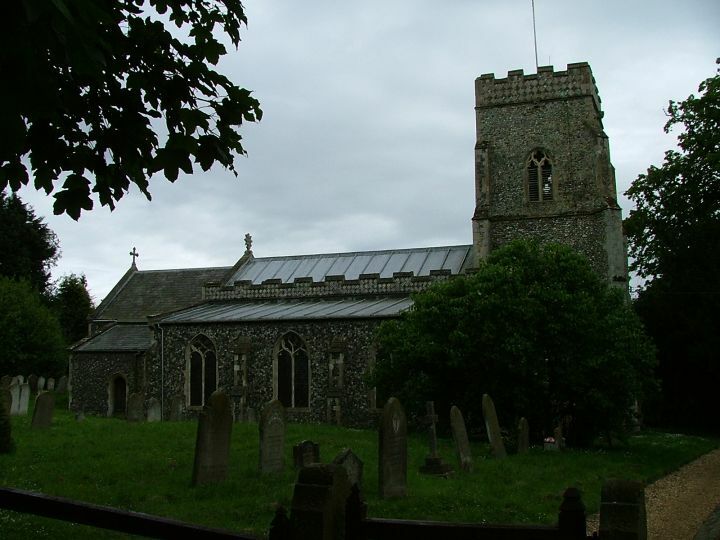 The Waveney Valley is a fairly miserable place to be a cycling church explorer - the main road is hideous, and most of the churches are locked without keyholders, especially on the Norfolk side of the river. However, when I climbed out into the gentle hills to the north of Harleston, I was immediately engulfed by the silence of narrow lanes running between high hedges, and the damp, warm smell of early summer that hung in the air. It seemed to promise more than I'd been given already. It was no surprise to find St Margaret locked (what is it about parishes in this area that they want to keep out strangers and pilgrims? Most other Norfolk churches are open every day) but I was fairly impressed to find a notice listing no less than NINE keyholders. It rather looked as if every member of the Sunday club had their own key. I rang the first number on the list, and was directed to a house about a mile back along the road I'd travelled from Redenhall. I remembered passing the house earlier, simply because it was so big - I mean vast. If it was in central London then there would be groups of Japanese tourists hanging around outside having their photographs taken in front of it. But the keyholder was very friendly, and a little perturbed to discover that I'd had to cycle all the way from the church. He offered to come along and get the key from me later, which was kind. I have to say (and if he reads this, I hope he won't be offended) that he bore a startling resemblance to the late television presenter Frank Bough, which must be either a cross to bear or a business opportunity, depending on how you look at it. By now, the sky was hanging heavy over south Norfolk, and it would come down in buckets before I got back to Diss station. But that was in the future. 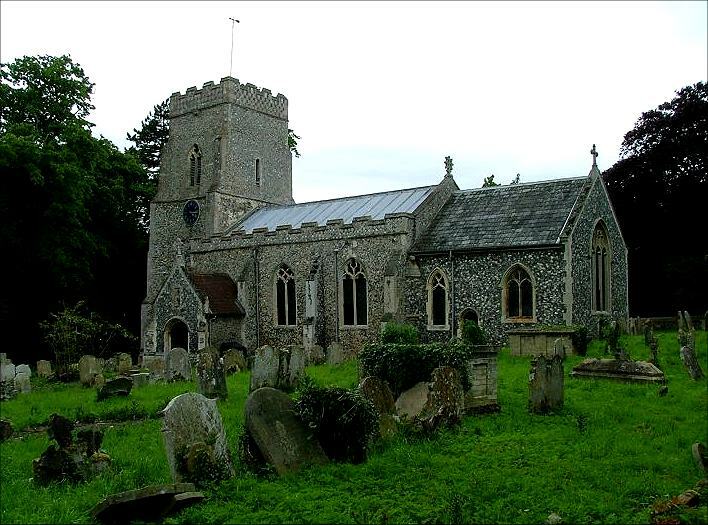 St Margaret stood proudly, a small church, in the greying light of the wide graveyard. The Victorianised chancel and medieval body and tower made a nice harmony. On the north side is a 19th century aisle, not unpleasing. 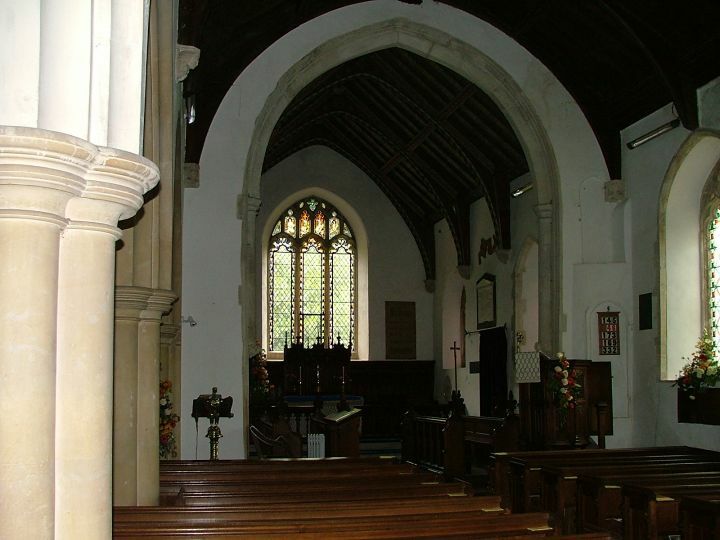 Most striking is the chequerboard flintwork of the nave and tower parapets - perhaps the medieval chancel had the same. 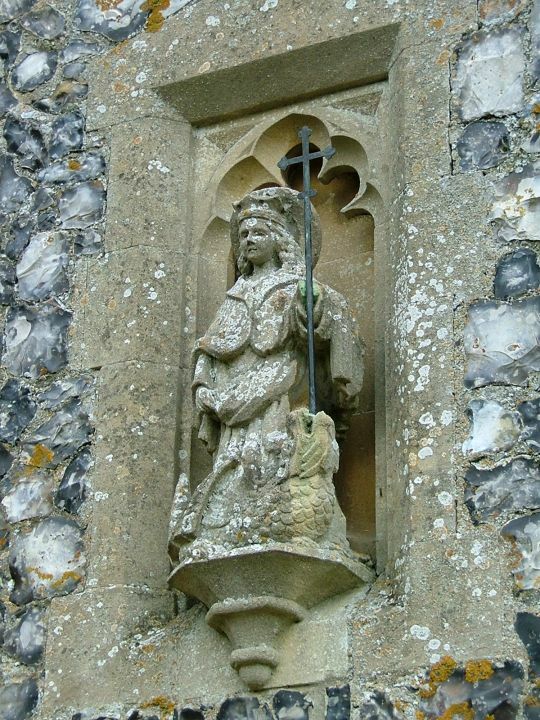 Inside, St Margaret is almost entirely the work of the 19th century, and medieval survivals are few and far between. 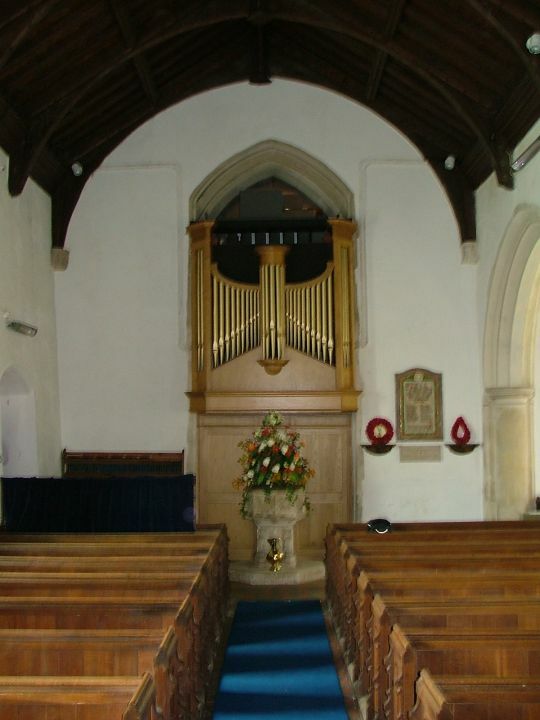 But it is a pleasant, welcoming interior, and the restoration and rebuilding were done well. 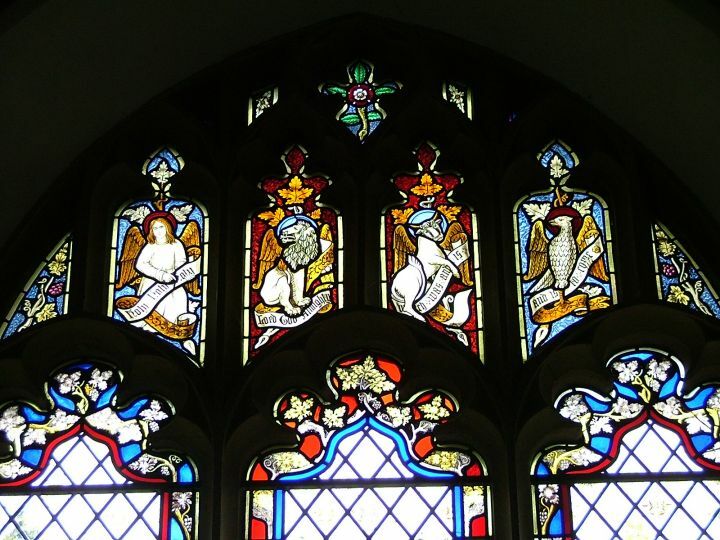 It was paid for by the Hoppers, a family who provided several 19th century Rectors. 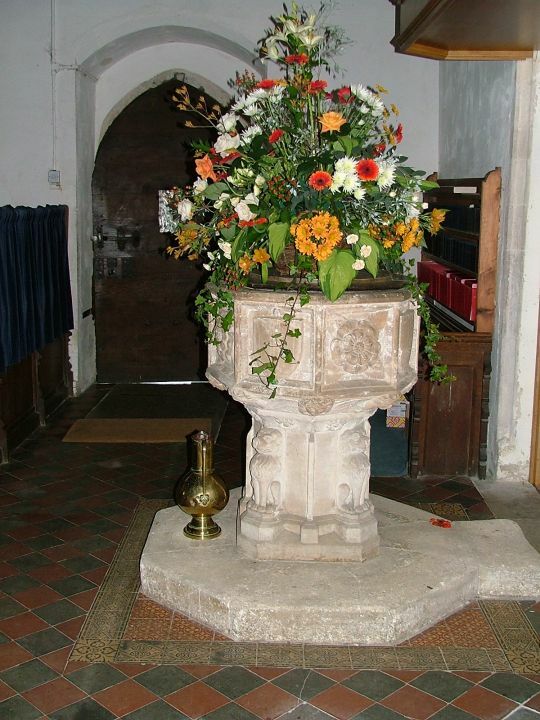 The 15th century font is typically East Anglian, with lions supporting shields and symbols. There's another one a couple of miles off at Needham. 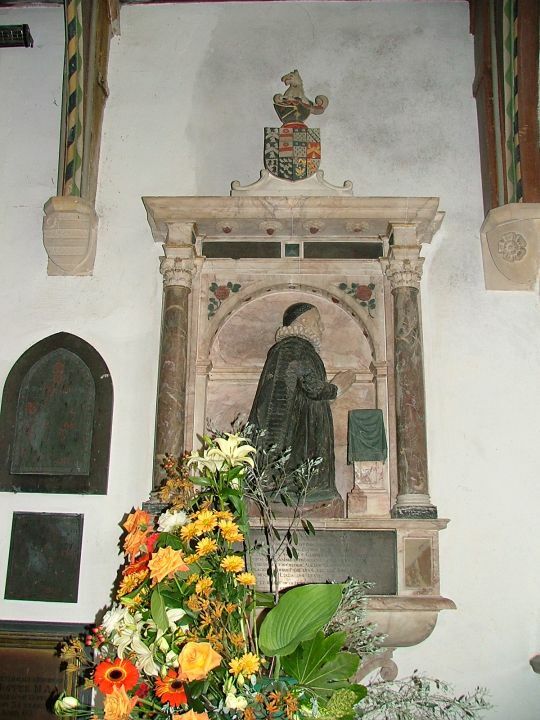 The most interesting feature is the wall-mounted memorial to Bartholomew Cotton, who died in 1613. He was clerk to the Star Chamber, that shadowy committee of judges leaned on by Charles I to give his totalitarian impulses legal credence. I'm no puritan, but the sycophantic scraping of those powerful law-makers would have had me reaching for the executioner's axe too. He kneels in piety at a prayerdesk. 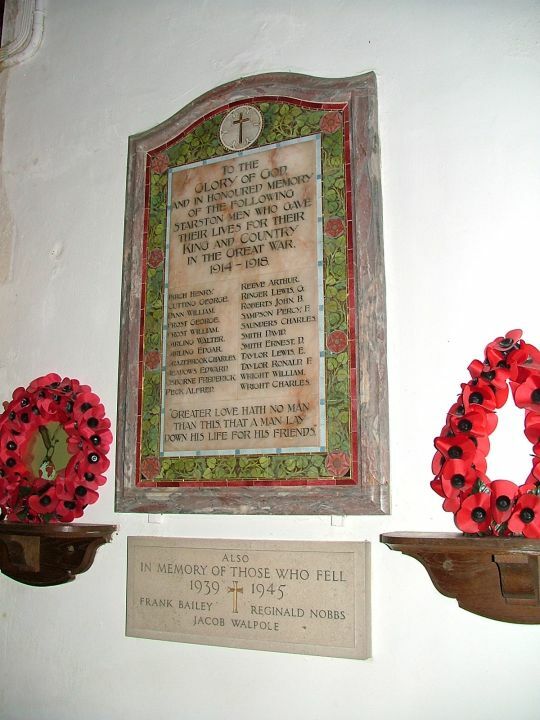 The memorial has recently been restored, and looks splendid. 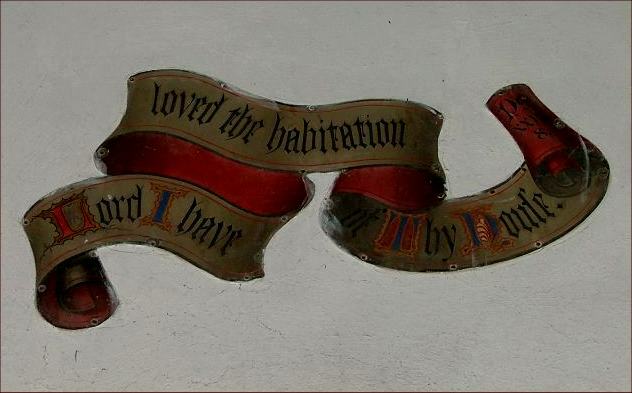 There is a curious Victorian painted scroll on the chancel wall that reads Lord I Have Loved the Habitation of Thy House - possibly there were once others, for this is a rare survival of the kind of Victorian motto-work you can see elsewhere in East Anglia at Wiveton and Helmingham. They were generally whitewashed in the less dogmatic, and less certain, century that followed. 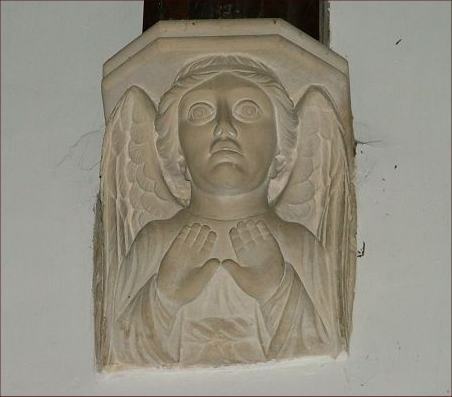 The kind churchwarden came to get the key, and we chatted for a while about the Cotton memorial, other memorials in the area and the churches of Norfolk and Suffolk in general. It seemed a world away from the hostility I had experienced at Scole and at Billingford earlier in the day, and I don't suppose I made it clear enough to him quite how grateful I was. And so onwards, out of this pretty village into the barleyfields to the north-east of Diss, with the ponderous clouds threatening more than the mere drizzle now obscuring the lane ahead.